Grilled lamb ribs fall into that category of foods which look elegant but require only basic outdoor cooking skills. Because grilling brings out lamb's smoky, succulent side, you won't need much more than a salt rub to tenderize the ribs and release their juices. For a special touch, however, consider including lamb's frequent flavor partners, such as rosemary, parsley and sage. Mince these herbs and include them in the seasoning rub, which will develop into an aromatic, crispy crust during grilling. Mix the seasoning rub in a shallow bowl. Chopped herbs such as rosemary, sage and parsley, as well as pepper, can be added in proportions according to your taste. The mix should include at least 1 tablespoon of salt for every 8 to 10 lamb ribs. Rub the lamb ribs on all sides with the seasoning mixture, and set the ribs on a baking sheet to rest while the grill preheats. Clean the grill grates, if needed, and lightly spray the grates with nonstick oil spray. Set up the grill for medium heat. Transfer the lamb ribs from the baking sheet to the grill. Let the ribs cook for at 3 to 5 minutes over medium heat. Turn the ribs over and cook for another 3 to 5 minutes. Insert a cooking thermometer into the fleshiest part of a sample rib to ensure that it has reached at least 120 degrees Fahrenheit for rare meat, or 130F for medium rare. Remove the ribs from the grill when they reached the desired temperature, and let them rest on their serving platter for at least 3 minutes. Rib chops tend to be thinner than other lamb chops, making them perfect for quick-cooking over a medium grill. If your chops are unusually thick, however, consider cooking them on the cool side of the grill, then finishing them over direct heat. This will prevent the problem common to thick grilled meat in which the cuts have a blackened exterior but an undercooked center. 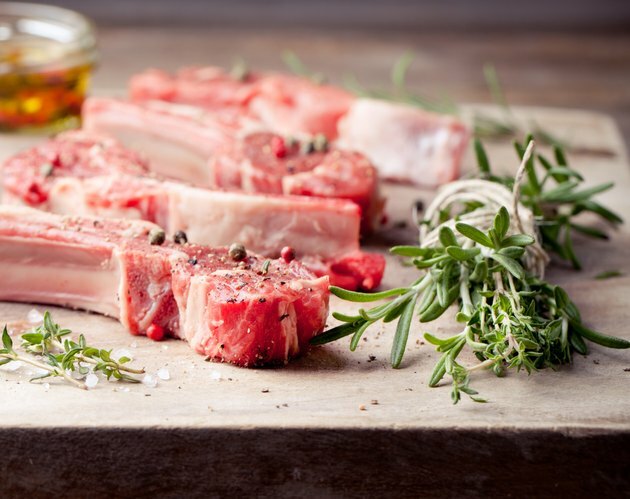 Serve lamb chops with a yogurt-mint sauce, mint jelly or gourmet mustard. Side dish possibilities include grilled new potatoes, wild rice, steamed peas or steamed green beans. Don't leave the grill while the chops are cooking, in case the dripping fat causes a small flare-up. Smother the flame with a lid and re-position the ribs if this happens. The USDA recommends a minimum cooking temperature of 145 degrees Fahrenheit, but you may prefer 130F degrees, which is regarded as medium rare.